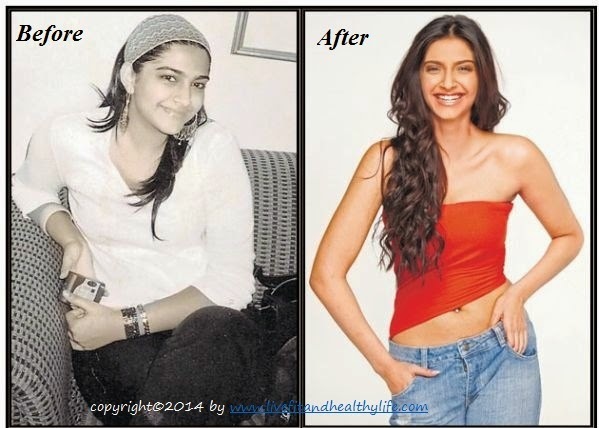 It is an open secret that Sonam Kapoor lost a lot of weight before she joined Bollywood. A self-confessed foodie she opened up in a recent interview about her dietary amendments that helped her lose those extra pounds. She gives all the credit to her mother who makes her follow a strict diet regime. A self-confessed foodie she gives in to her indulgence for chocolate and ice-cream from time to time. For in-between snacks she munches on dry fruits and carries fruits while she is travelling to avoid hunger pangs. Her exercise regime consists of everything including weight training, yoga and pilates. When she gets the time she plays squash and or swims. She followed this routine for a year and lost 30 kg. Although now she can afford to eat whatever her heart desires she still sticks to a strict regime, indulging only occasionally. She starts her day with a tall glass of lukewarm water and follows it up with another glass of warm honey and lime water. She also drinks a lot of fluids throughout the day like coconut water, cucumber juice and buttermilk.